What’s Next for Certain Affinity? Once a video game development studio goes international, conventional wisdom holds that they have reached the absolute pinnacle of their profession. With the opening of a new studio in Toronto, Certain Affinity joins the ranks of industry titans stewarding the present-day growth of games as an art form. But how can we enable the up-and-coming developers of tomorrow to share in the sweet smell of success? It’s not as if we can bottle it…or can we? 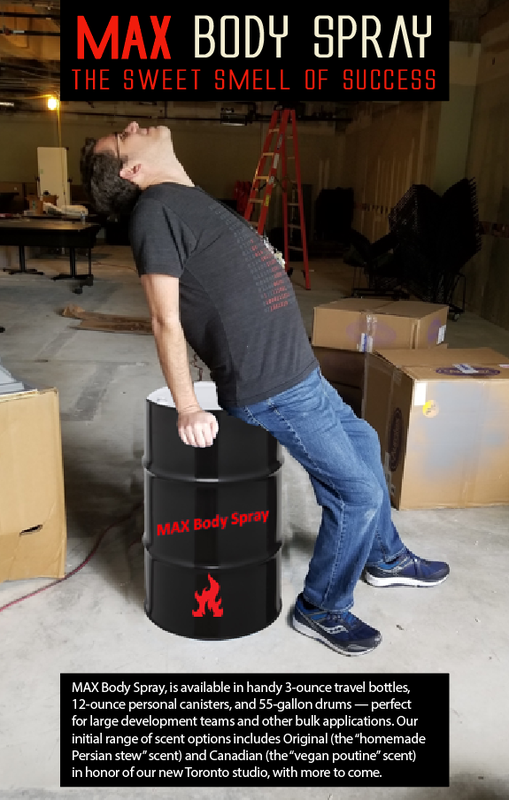 Certain Affinity is proud to introduce our first fragrance: MAX Body Spray, the only personal scent enhancement product designed with an eye towards sustainable, long-term success. Created by Certain Affinity founder and president Max Hoberman, MAX Body Spray is derived from Max’s own natural scent, along with a melange of organic aromas chosen specifically for their aesthetic and/or inspirational properties. These subtle scents differentiate MAX Body Spray from other aerosol-propelled aromatics, and they’re designed to help you and your team conquer any obstacle on the road to success. Available in handy 3-ounce travel bottles, 12-ounce personal canisters, and 55-gallon drums — perfect for large development teams and other bulk applications — MAX Body Spray comes in Original (the “homemade Persian stew” scent) and Canadian (the “vegan poutine” scent) varieties, with more to come. Click the button below to place your order!